Published on January 18, 2014 in corruption, Crime in T&T, Drug Trade, General T&T, International, Money Laundering and USA. 6 Comments Tags: Cocaine, Crime in T&T, Newsday, SM Jaleel, USA. THE biggest ever drug bust in the history of the Norfolk Port in Virginia, United States was made on December 20 when US Customs Border Protection officers seized 332 kilos of cocaine which originated from Trinidad and Tobago and which carries an estimated street value of US$100M or TT$640M. 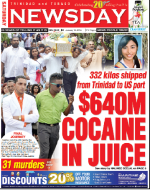 The cocaine was stored inside tins of Trinidad Juice Company juices which were part of a consignment of goods that arrived at the Norfolk Port after being shipped from Trinidad. The cocaine, believed to have originated from South America, was hidden inside 700 juice tins bearing the markings of the Cooperative Citrus Growers Association (CCGA) which is located off the Eastern Main Road in Laventille.